Listen up duners! 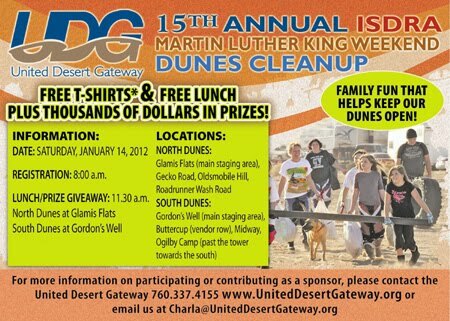 The 15th Annual MLK Dune Cleanup is quickly approaching. Dune cleanup events are a great way to spend a couple of hours volunteering your time in return for a cleaner desert and a chance to win some great prizes. Are you planning to attend? Free t-shirts & Free Lunch, along with thousands of dollars in prize giveaways. To participate, just go to one of the listed registration sites, beginning at 8:00 am, to register and pick up your trash bags. The first 3,000 volunteers to register will receive a free event t-shirt. Between 8:00 am – 11:30 am, volunteers will roam the desert, picking up trash. Bags of collected litter will then be traded for raffle tickets. Lunch will be served at the main staging areas between 11:30 am-12:30 pm, with the prize drawings to be held directly after lunch. The 15th Annual Dunes Cleanup is proudly presented by the United Desert Gateway, Monster Energy Drink, Rally’s Burgers, Unchained Studios Unlimited, Got Desert ID?, and the Bureau of Land Management.